A simple cage comforter can make a dog or cat's stay at the shelter less stressful. Small quilts change the lives of shelter animals. Cage comforters are simple, small quilts placed in the cages of shelter animals. Not only do they make the cage a more comfortable place to be, but they also can help to increase an animal's chances of adoption by reducing stress and allowing potential adopters to more easily see the animals as part of their homes and lives. 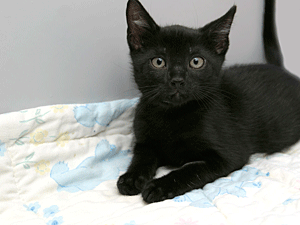 Anyone who can thread a needle can create a cage comforter, and help get a Little New Yorker adopted! If you are a home economics teacher, or other professional who works with people for whom a sewing project would be useful, you might consider starting a cage comforter project — a terrific opportunity to learn and help at the same time. If you are starting a cage comforter project and would like us to mail information about the Mayor's Alliance for NYC's Animals and animal issues in NYC for your group, please feel free to contact us. A little poly-fill, batting, or other soft material is used for padding inside. Innards from old comforters, pillows, and mattress pads work well. Padding doesn't need to be thick — just enough for the pet to have a little cushion. Tip: Good inexpensive sources of materials include thrift store comforters, crib bumpers (great source for cheap poly fill), flannel sheets, quilts, baby and receiving blankets, old pajama bottoms, table cloths, or bathrobes. Please wash materials before sewing. Cut two pieces of material to use as top and bottom of the outside of the comforter. Place the two pieces of fabric one on top of the other. Make sure the "wrong" side of both pieces of fabric are facing out. Turn inside out so that the "right" side of fabric is facing out. Insert a bit of cotton batting or fluffy material. Fold over and sew the fourth seam. Secure the poly fill by sewing an inner seam (like quilting) around all 4 sides and/or sewing a middle seam with the machine (this is so that the filling doesn't bunch up when washed). 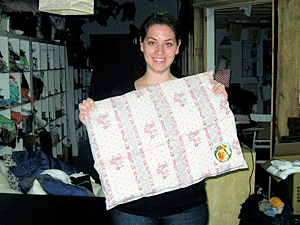 Rational Animal volunteer Michelle Aptman shows off a cage comforter stitched at a Mother's Comfort Project sewing event. If you plan to make several or many cage comforters, please feel free to wait until you have completed several or a stack (whatever is comfortable for you) before mailing. Questions? Please contact us at info@AnimalAllianceNYC.org or (212) 252-2350. New York City's municipal shelters can be harsh. Dogs, cats and other animals are housed in small cages and bedding often consists of towels. Through the Mother's Comfort Project, Rational Animal provides comfy homemade beds for animals to curl-up in and muffle the noise. The beds and catnip toys are sewn by Rational Animal volunteers and school clubs at sewing studios in Brooklyn, then they are delivered to Animal Care Centers of NYC, where volunteers place them inside cages and give pats of hope to weary souls. To date, over 2,300 beds and 1,600 toys have been delivered to New York City shelters, providing comfort for thousands of homeless animals. Novices and experts alike are invited to join Rational Animal for an afternoon of pet bed sewing and socializing! Not a sewer? We are always in need of transportation assistance (from Manhattan to Brooklyn and back again), fabric and batting donations (must be machine washable and durable), and photography skills.